Grab your bags and glasses, pots and pans for more musical fun with these great original songs! By Alice Olsen. 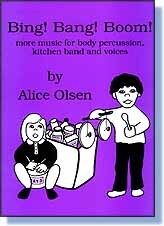 Her collections support the Orff Schulwerk approach to music education and are full of creative ideas and imaginative activities! Songs include Body Samba, Tropical Birds, Listen to the Ocean, Hoedown, Rhythm Rondo, Tube Time, Bing! Bang! Boom!, Alligator Stew, Garbage Galore, Monkey, Way Out West, Star Traveler, Sing Out For Sunshine, and The Animals' Song.